Hawkwind were masters of the genre, with songs played at blistering traveling through hyper space speeds, woodwinds, synthesizers, world-eating riffs, and science fiction inspired lyrics. Their live shows were equally impressive, with stage dancers, mimes, light shows and the like. My favorite Hawkwind material is from around 1970 to 1974. 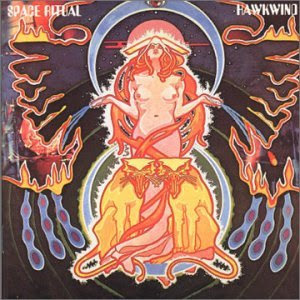 A good place to start is "Doremi Fasol Latido" (1972), and the mind blowing double disc live album "Space Ritual"(1973). There is also a greatest hits album from that time period, "Psychedelic Warlords", that I highly recommend. Here's three of my favorite Hawkwind songs, "Silver Machine", "Orgone Accumlator", and "Urban Guerilla". Enjoy! I first came upon Hawkwind by way of a friend of mine. He knew that I was a big fan of the author Michael Moorcock, and one I heard about his connection to the band I was in. It's not a bad I can listen to all the time, but if I'm just sitting down to read some George RR Martin or Moorcock himself, then it's time for a spot of the 'wind. It was probably through my uncle that I came to Hawkwind in a big way - Hawkwind and Michael Moorcock together. I'm an extra special fan of "Hall of the Mountain Grill" - contains the classic "Lost Johnny" another Lemmy vocals track. I remember listening to that album, age 14, lying on my bedroom floor, writing one of my best ever English essays; two sides of A4 paper - side A on Lawrence Ferlinghetti "The world is a beautiful place" - side B on "Vultures" by Chinua Achebe. B+ if I remember right. Thank you both for the comments. Hawkwind a were truly legendary highly influential band, one I never grow tired of.